Frankfort Mineral Springs – showcasing nature’s perfection since who knows when. Shawnee and Lenape inhabitants of the area used these springs centuries ago. Notably rich in magnesium carbonate and iron, the springs brought relief, both as a cold bath and a drink, to those experiencing chronic rheumatism, indigestion, and liver complaints. A popular resort was built for the wealthy, then later accidentally set ablaze in 1932, while all that remains is a guest cottage – and, of course, the springs. 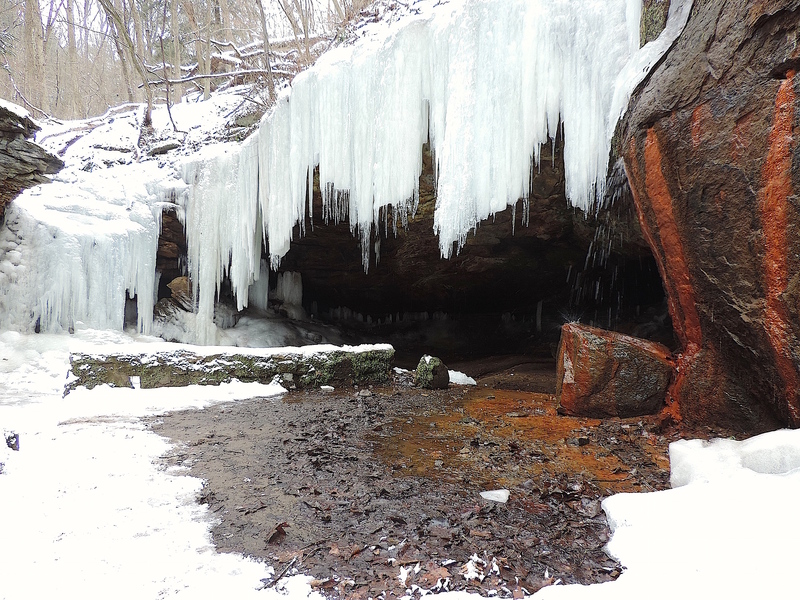 As you can see, the adjacent waterfall is frozen while the springs (right side of photo) trickle out fresh from the shale and sandstone formation – providing free, highly mineralized water for those who are open to the experience. If you pass through Western Pennsylvania, make your way into Raccoon Creek State Park, and this will become your reality.